Laurin Teddy Bear by Steiff. This beautiful hand made piece, in lilac mohair, wears the white ear tag, signifying this item as a Steiff limited edition, together with the famous gold plated Button in Ear. Limited edition of only 1000 pieces worldwide. Product details: fully jointed (loosely jointed head and arms), safety eyes, synthetic filling material, non growler, size 28cm. Comes boxed, together with a numbered certificate of authenticity. 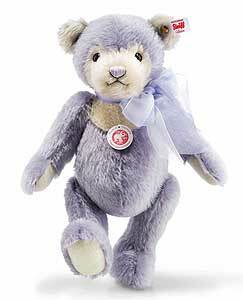 Ashby Bears proudly presents LAURIN TEDDY BEAR Laurin is our messenger of Spring! She welcomes in Spring dressed in the finest lilac-coloured mohair. And her ears and paws form a fine contrast to her delicate cream-coloured face. The whole picture is beautifully finished by the light and airy, double looped organza ribbon. One can almost smell the lavender! Together with Laurin you are certain to savor the most joyous season of all – Spring!